We offer fishing on many of the local rivers and lakes in central PA. We provide the fishing rods and the bait while you provide the courage to put the worm on the hook and the patience it takes to “catch the big one.” The rivers we fish are all tributaries of the Juniata River, which flows into the Susquehanna River and is part of the Chesapeake Bay Watershed. 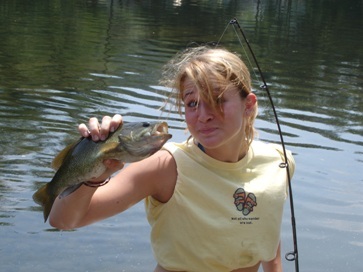 We fish for trout, bass and catfish at Stone Mountain Adventures. A peaceful morning or an afternoon fishing activity while cooling your feet in the fresh water of a pristine river or mountain lake can be the perfect respite from other adventure activities at camp.